This Southern Living house plan, SL 1648 “Sugarberry” was built on an empty lot in our neighborhood. It blends nicely with the older homes. It is absolutely the most adorable cottage ever! We had the pleasure of watching it being built and the result was nothing short of spectacular. It has great presence for a somewhat smaller house (1714 sq. ft.). One thing different (that I love) about the house in our neighborhood… the extended the porch. See how this porch begins at the point where you walk in the door? They extended the porch to fill in that area to the left, so it goes all the way back to the kitchen sink. It’s nice, they have a porch swing on that side and it’s more private. Very sweet. The house here locally also has a fireplace on the side porch on the right, how nice would that be??! Do you have a hard time visualizing this house? Take a virtual tour on Southern Living’s House Plan site, see what it actually looks like! 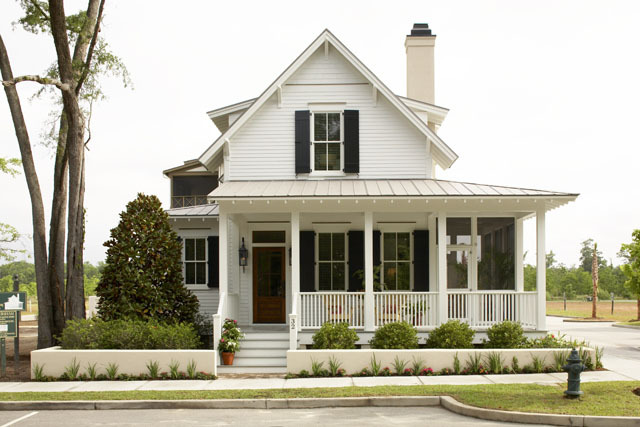 This house a beautiful addition to the neighborhood, nestled amongst the grand live oak trees, with ferns planted in the front yard, it’s like something from days gone by… such charm! It is similar to one I saw in Mount Pleasant. It, too, had red chairs but the porch did not have the railing as this one does. Would you please post a picture of the house in your neighborhood? We have purchased the house plans with the extended porch and fireplace in porch and are curious to see what it looks like. We are getting bids from contractors and plan on breaking ground in the next couple of months. Thanks! No problem Molly! You picked a beautiful house plan! What a cool video! Beautiful home! Congratulations! This should help anyone visualize the plan! Great Video! Great House! Thinking about buying plans and modifying. Do you have a detached garage or attached? I would love to see the pictures of the backside of your home showing garage. Hello Richard! I have not built this house (I only feature house plans each Thursday), but there is one in our neighborhood, the garage is detached and is just as cute as the house! However, I don’t believe the garage is a true garage, more of an outbuilding, no room for a car. – One thought… There was another popular plan TIDELAND HAVEN, and there were many questions, so I suggested someone start a Facebook group, which has been great. Those who are building, modifying, etc share their ideas, so that may be an idea for the SUGARBERRY COTTAGE as well! I love your home!!! Did you extend it from front to back? We’re considering the sugarberry plan, but extending it to make the dining area and kitchen a little longer/wider, and to add a door to the left side of the fireplace (which I think is what you have done). We would also add a hall way on the back side of the stairs for a drop zone/desk area/exit to detached garage. Could you tell me how many sq ft your home is? Thank you! Thank you for your comment Ember. Look for details within the post. You can click on links to be taken to the actual plan as well as a virtual tour. I believe it’s 1,714 square feet. This is a home built near us, it is t our house, but it is lovely! It has so much character! Good luck!